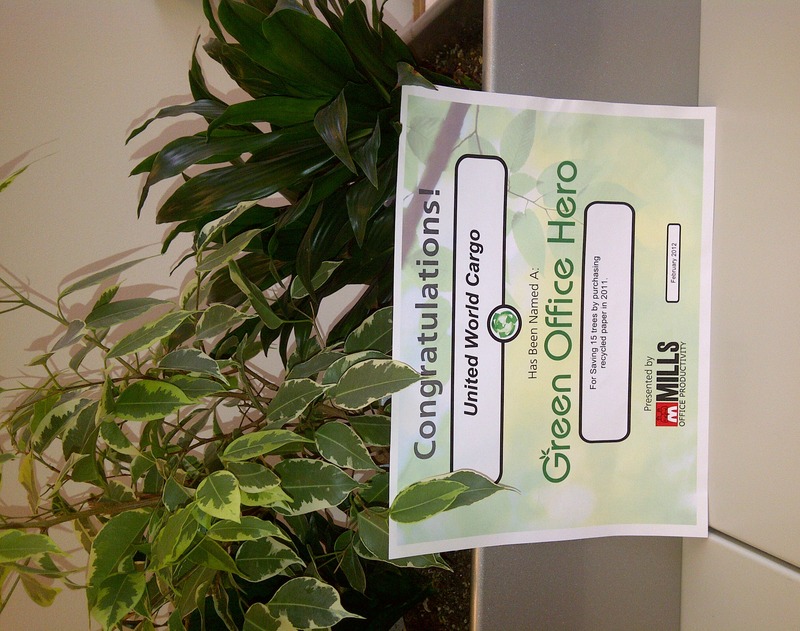 Green initiatives are all the rage these days, particularly in the transportation industry. Here’s a fact: transport systems have significant impacts on the environment, accounting for between 20 to 25% of world energy consumption and CO2 emissions. The focus on green initiatives can be seen throughout the industry: from increases in the production and sale of passenger hybrid vehicles, to increases in public transport infrastructures nationwide, to an increase in truck route planning software to design and optimize route efficiency. Ideal route planning software solutions often include GPS tracking capabilities and advanced reporting features that allow for reduced mileage and more fuel efficient routes. SmartWay – UWC is a SmartWaySM Transport Program Partner, a commitment that promotes great energy efficiency and air quality within the industry, and pledges a reduction in our carbon footprint. The Road Ahead – Our monthly newsletter is available for distribution via email. Give the fax a break; sign up today – it is distributed on the 15th of every month, in English and Spanish! Paperwork – load confirmations, payment confirmations, and any other correspondences can also be emailed to you. 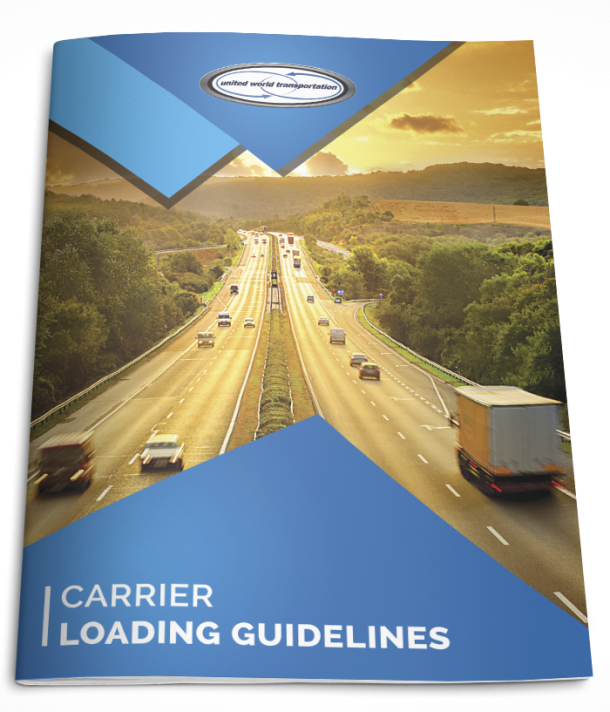 Contact our Carrier Relations department today on their toll free dedicated line 1.866.986.7410 or via email at carriers@unitedworldcargo.com and let us know you are joining the movement and would like these emailed to you! Direct Deposit – choose this payment method over paper checks. The program is secure and efficient; all you need to do is provide us with your bank details and we can have your invoices paid directly in to your bank account. Available in Quick Pay for a small fee or standard 7 Day term with no fees. Call us for more info! Office Practices to Reduce, Reuse and Recycle – Food container recycling, installation of a garbage disposal unit, and converting from a gallon water dispenser to a tap filtration system are some of the updates we have made to our office in order to continue down the green path. 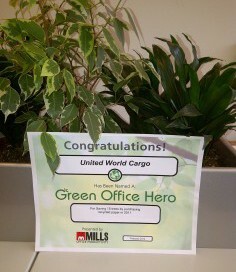 We also use recycled paper throughout the office that is made of 50% post consumer material. And… the revolution is paying off!!! 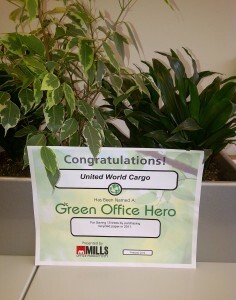 United World Transportation has been named a Green Office Hero for saving 15 trees by purchasing recycled paper in 2011!!! Some of the small and large commitments that we individually and corporately practice to protect the environment for the future produce transportation providers of the world! Stay tuned, we will have an exciting development related to sending your paperwork to UWC in the coming weeks!!! So, are you joining the Green Revolution?